Are Mystery Clouds of Venus a Warning Sign for Earth's Climate Battle? This false-color ultraviolet image of the south pole of Venus was obtained by the Venus Monitoring Camera onboard The European Space Agency's Venus Express on Feb. 25, 2008 from a distance of about 12,400 miles (20,000 kilometers). The octagonal shape of the image is due to the VMC field of view. Mysterious clouds discovered on Venus are not only helpingscientists learn more about Earth's closest planetary neighbor, they also serveas a cautionary tale for one proposed method of combating climate change on ourown planet. The peculiar sulfur dioxide clouds of Venus have perplexedscientists since they were first discovered in 2008 by the European Space Agency'sVenusExpress spacecraft. The study may also mean that one idea for addressing globalwarming on Earth ? injecting sulfur droplets into Earth's atmosphere ? may notbe as effective as previously thought, researchers said. Zhang and colleagues from the U.S., France and Taiwan showthat some sulfuric acid droplets may evaporate at high altitudes, freeinggaseous sulfuric acid that is then broken apart by sunlight, which in turnreleases sulfur dioxide gas. Venus is blanketed in clouds of sulfuric acid that obscureour view of the planet's surface. These clouds typically form at altitudes ofabout 30 to 40 miles (50 to 70 kilometers), when sulfurdioxide from volcanic activity combines with water vapor to form dropletsof sulfuric acid. At elevations higher than approximately 43 miles (70 km),any remaining sulfur dioxide should be rapidly destroyed by exposure to intensesolar radiation at such altitudes. So, when Venus Express detected a layer ofsulfur dioxide at altitudes of about 56 to 68 miles (90 to 110 km), it leftscientists scratching their heads. "We had not expected the high-altitude sulfur layer,but now we can explain our measurements," said H?kan Svedhem, ESA projectscientist for Venus Express. "However, the new findings also mean that theatmosphericsulfur cycle is more complicated than we thought." Warning sign for Earth climate fixes? While the findings shed light on the nature of Venus'hellish atmosphere, they may also disprove the effectiveness of onesuggested technique for mitigating climate change on Earth. Nobel prize winner Paul Crutzen recently advocated injectingartificially large quantities of sulfur dioxide into Earth's atmosphere ataltitudes of around 12 miles (20 km), to counteract the effects of globalwarming from increased greenhouse gases. The proposal stemmed from observations of the aftermath frompowerful volcanic eruptions. In particular, the 1991 eruption of Mount Pinatuboin the Philippines shot deposits of sulfur dioxide into Earth's atmosphere.Reaching an altitude of 12 miles (20 km), the gas formed small droplets of concentratedsulfuric acid, similar to those found in the clouds on Venus. These clouds then spread around Earth, and the dropletscreated a layer of haze that reflected some of the sun's rays back into space,which cooled the whole planet by approximately 0.9 degrees Fahrenheit (0.5degrees Celsius). In light of these new findings, injecting sulfur dropletsinto Earth's atmosphere may not be as effective a method of battling climatechange as once thought. For one, it is not known how quickly the initiallyprotective haze will be converted back into gaseous sulfuric acid, which istransparent and allows the sun's rays to pass through. "We must study in great detail the potentialconsequences of such an artificial sulfur layer in the atmosphere ofEarth," said Jean-Loup Bertaux, a researcher at the Universit? deVersailles-Saint-Quentin in France. Bertaux is also the principal investigatorfor the SPICAV (Spectroscopy for Investigation of Characteristics of theAtmosphere of Venus) sensor on Venus Express, an instrument that probes theVenusian atmosphere. ? 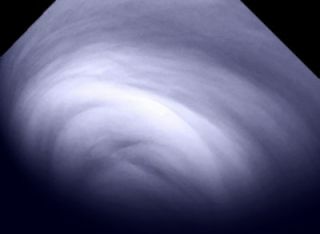 "Venus has an enormous layer of such droplets, soanything that we learn about those clouds is likely to be relevant to anygeo-engineering of our own planet," Bertaux said. This story has been updated to correct the conversion error.